Zhenyun Liu is one of China’s best-known writers; many awards for his novels, a great success for the many films based on them. He was in Paris a few days ago to present two of his books: ” Remember 1942 ,” an essay on the famine in Henan Province and a novel: ” A word is worth a thousand words“, a text on communication and loneliness, which was awarded the main literary prize in China, the Mao Dun . 1942 , a duty to remember or forget ? Liu Zhenyun is from Yanjin, the area most affected by the famine in Henan Province. He recalls in an article in the New York Times that up to 32 years he knew nothing of the disaster that killed three million people. He underlines that for the Chinese, who in their history have faced so many tragedies, it is ” humor and a large dose of amnesia that are solutions to face tragedies”; Westerners say “Remember “, Chinese ” Forget”. Given the survivors ability to forget, the author tells us that he chose to write an essay rather than a novel where readers could think the descriptions were not real This text is very interesting and is read with pleasure but one can regret the epic style of the novel by Yan Lianke “Four Books” which discusses another much more tragic famine that of the Great Leap Forward in 1960. The author reminds us that in 1942, Henan was threatened in the north and east by the Japanese army. Disastrous harvests due to drought and locusts while rents, taxes and grain deliveries to the army were not reduced. The famine led to a mass exodus of farmers to the west. The Henan became a “no man’s land” and the Japanese were in no hurry to invade. The nationalist government would have had the means to help the population, but Chiang Kai- shek did not believe the reports which he received and considered that he had more important issues to deal with . As the author writes: “Fifty years after the events, I am ashamed of our own attitude, ashamed of our lack of interest in history and ashamed that it had to be a foreigner to investigate and to turn a look of compassion, over this period”. T.H. White of Time magazine and Harrison Forman of The Times of London, visited the area. Horrific visions, the dogs eat bodies and fight for them with men. As written by Liu Zhenyun:” A nation that cannot revolt but where citizens are simply able to eat each other cannot harbor any hope”. On the internet can be found the photos by Harrison Forman, photographs that shocked Chiang Kai- shek who met the two journalists and pushed him to react. T.H.White published two books on this investigation in Henan, one in 1946 which was translated into Chinese twenty years ago and to which Liu Zhenyun often refers. The novelist does not hesitate to report the events which followed: farmers overburdoned by the deliveries to the Chinese army and saved by Japanese food, have helped , guided, supported the Japanese army and disarmed demoralized Chinese soldiers. During spring 1944, 60000 Japanese caused 300000 victims in the ranks of the Chinese army. Upon its release in 1992, the book has faced no difficulty. It is true that the famine was a consequence of the policy of the Nationalist army. However the film by Feng Xiaogang took years to be shot: financial problems, difficulties with censorship … The filming has even begun without permission. The film cost 25million euros which have been recovered by the tickets during the first week in November 2012 and was presented in the United States but is not distributed in France . The controversy is still hot on the net: why 1942 but not 1960, the famine of the Great Leap Forward, which caused 36 million deaths. The basic document on the subject, the book by Yang Jinsheng “Tombstone” , translated into English in 2012 , is banned in China. This book states that for Henan including the south of the province, the “unnatural” deaths totaled 1.7 million plus a deficit of 2.3 million births . Yang Jinsheng underlined that from 1959 to 1962, China is not at war as in 1942, that natural phenomena played only a secondary role. The difference is that in 1942, the peasants could flee Henan while in 1961 and in a totalitarian system, “the government monopolizes the production and vital resources; in case of disaster, people do not have the ability to save themselves”. Liu Zhenyun is 55, he was a soldier for three years and then a teacher. 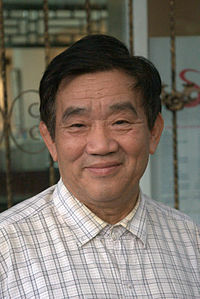 He was a member of the first graduating class (1982) of Peking University that followed the Cultural Revolution. He became famous with the TV adaptation of the short story “Garlic skins and chicken feathers ” , translated into French by Sebastian Veg and published by Bleu de Chine in 2006 (which released also “Mandarins” in 2004). Several of his novels have been best-sellers as books but also as films. The film adapted from the short story “Mobile phone ” was the N° 1 in the Chinese box office in 2003. Other novels not yet translated made an impact: “I ‘m Liu Yuejin ” ( 2007), a book about a migrant who works on a construction site in Beijing. A plot close to a detective novel which was adapted as a film. In 2012, he published “I ‘m not a Pan Jinlian ” (referring to the unfaithful heroine of a classic novel), a woman who is wronged by a judgment of divorce and accused of being unfaithful. For twenty years, she tries to have her rights acknowledged, but this is not a political book says Liu Zhenyun ! The French translation of this long novel is important because it is a very special book. It takes place in Henan in the Yanjin area and in two parts separated by about fifty years . The descendants of the characters that surround the young Yang in the first half of the book, are found much later around Niu Aiguo. This is a novel where historical events have no role and which is not precisely dated. Liu Zhenyun considers it as a strong point and wanted to concentrate solely on the history of individuals. The characteristics of the period are pictured by the details of daily life. It is a choice which, in my opinion, is not totally convincing from a literary point of view . The writer points out that China is a country without religion, without God. The “Analects” by Confucius are focused on the relationship between man to man whereas the Bible deals with the relationship of man with God. The solitude of a society without religion is for the author the main theme. We are struck by the role of speech, often misguided, for men, but especially for women. Gossip manages to destroy the strongest friendships so as comments under the influence of drinking. Friendship is often an artificial relationship that can shatter on money problems and Niu Aiguo is sensitive to the fact that he has few friends and not reliable. The price is loneliness, and his sister is getting married because she can no longer stand to be alone ! The writer wishes to distance himself but expresses his sympathy for many of his characters. He often recalls the main features so that readers don’t get lost . Interesting portraits, great humor, a fascinating study of everyday life, but sometimes too detailed. We cannot escape to any of the eight successive jobs of young Yang and to their social and emotional environment! Liu Zhenyun , ” Remember 1942 “, translated into French by Genevieve Imbot-Bichet . Bleu de Chine Gallimard, 2013. 120 pages, 15.90 euros. 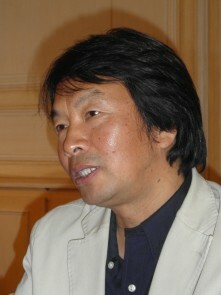 Liu Zhenyun , ” A word is worth a thousand words ” , translated into French by Isabelle Bijon and Wang Jiann – Yuh . 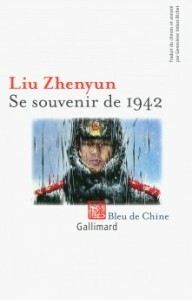 Bleu de Chine Gallimard, 2013.720 pages , 28 euros. Yang Jisheng , ” Stele , the great famine in China, 1958-1961 ” , translated into French by Louis Vincenolles , Sylvie Gentil , Chantal Chen- Andro . Le Seuil, 2012. 660 pages , 28 euros. Yang Jisheng, « Tombstone, the great Chinese famine (1958-1962) », translated into English by Stacy Mosher, Jian Guo; introduction by Edward Friedman and Roderick MacFarquhar; published in 2012 by Ferrar, Strauss and Giroux. Paperback to be released in a couple of days, 656 pages, 17 usd. Yan Lianke , ” The Four Books ” , translated into French by Sylvie Gentil. Editions Philippe Picquier , 2012. 416 pages, 20.80 euros.